Even though the kids have been in school for a couple of weeks now, it still feels like summer around here. Why couldn’t it be this hot when we had swimming lessons at the pool each day? Speaking of the pool, I got a whole lot of reading in this summer while waiting for my kids at their swim lessons. It was awesome…lounging by the side of the pool with a good book is my idea of a good time. I read so much that I’m almost at my goal for the number of books to be read this year, and there are still 3 months left to go! Anyways, I wanted to share with you some of the books that I read this summer, in case you might find something that you like 🙂 Please note, this post contains affiliate links. Sally is so full of womanly wisdom, and it shines throughout this wonderful book. Oftentimes we women, and moms especially, feel like our lives go from one thing on our to-do list to another, and we rarely get the chance to actually live. How can a mom find joy in laundry, dishes and the drudgery of housework? How can we stay joyful through difficult times and in losses that are a normal part of life? 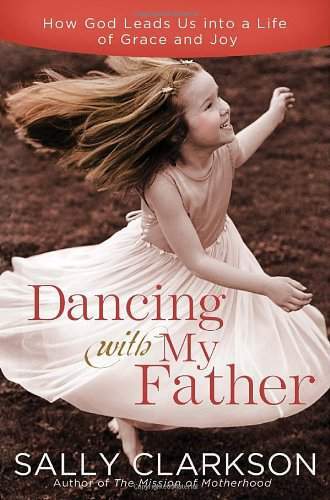 Dancing with my Father addresses these questions and gives encouragement. This was the last book of Sally’s that I had not yet read…talk about saving the best for last! Reading about Sally’s adventures as a missionary in Eastern Europe, about her life as a young married woman, and of course, as the mother of 4 children, I gleaned a great deal of her wisdom that I can put into practice in my own life. My local library system doesn’t carry very many Christian books (or at least the ones I’m interested in reading), so one day I decided to do a search by publisher, plugging in the names of some well-known Christian publishing houses. 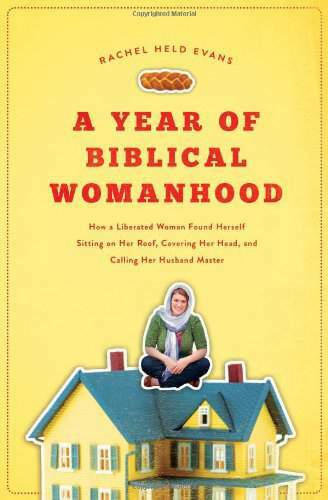 When A Year of Biblical Womanhood popped up in the search results, I decided that it sounded interesting enough to check out. My favorite part of a sermon is “the story behind the story,” when the pastor tells us some of the back story relating to the passage he is preaching on (i.e., cultural details, geography, etc.) that didn’t make it into the main story. This book is chock-full of those details, which I found very interesting and has changed some of my views on Biblical womanhood. I picked up this book at the library on the recommendation of a blogger who posted about how much she liked this book. While it’s a great message, and I totally agree with it, I found this book to be SO depressing. Each chapter drags on and on about how much the author has missed parts of her children’s growing up because she became obsessed with other things, especially her phone, which attracted her with constant text messages, emails and the like. After a few chapters, I was ready to abandon this book, but I read on until the end…it didn’t get better, I’m sad to say. My neighbor found a copy of this book while clearing out some clutter and offered it to me. I was hooked from page one…it’s a fabulous story. While I don’t really agree with the author’s life choices and didn’t really care for some of the language she uses, Elizabeth Gilbert is a very talented story teller. I think I read the entire book in the space of 3 days…I just couldn’t put it down. Incidentally, the follow-up book to Eat, Pray, Love, Committed: A Love Story , was rather good too, although, again, I didn’t really agree with her thoughts on marriage, but I had to see if she and Felipe would end up together in the end. This is another book I’ve heard mentioned over and over again on some of my favorite blogs, so I checked it out from the library and I wasn’t disappointed. Rhinestone Jesus is the story of Kristen’s faithful journey to creating a maternity house for unwed mothers in Kenya. Through her desire to help women in some of the worst conditions, she relied on God fully and totally to enable her team to provide a safe place for girls who have no medical care or family support. I was so inspired by Kristen’s words…how one person with a loving heart can help so many people, even though she might not have a lot of resources or training. Have you read any of these books? What’s been on your reading list this summer? THANK YOU so much for this great list, Erin, and for giving your honest opinions! 🙂 I really want to read more of Sally Clarkson’s books, and Rhinestone Jesus sounds good, too.